The Gourmet Goddess is not kidding when I say I make something for everyone. We are having 12 people this Thanksgiving and I have planned 12 dishes. I want everyone to be happy and well-fed. By divine goddess power, prior planning and making some dishes ahead, I manage to warm all the eats to the right temperature at the same time on Thanksgiving. If you are hosting, I think the key ingredient to a relaxed day is not leaving all the cooking to T-Day. Prepare an extra turkey and gravy a day or two before. You can cut up the turkey and assemble leftover packets for yourself or guests and making the gravy ahead of time is a wise investment to protect your sanity, you just need to heat it up on the day. 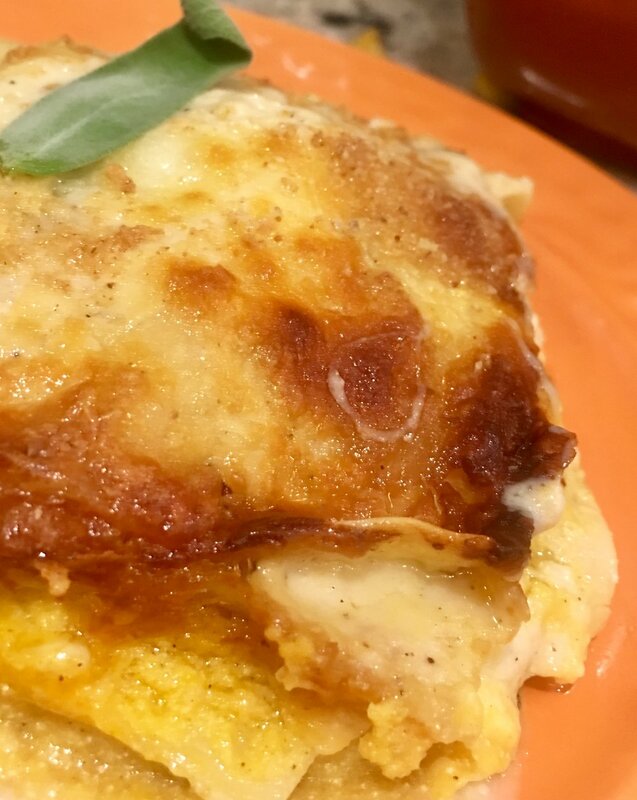 This butternut squash lasagna is a perfect solution for a make the day before dish. It is unbelievably delicious, looks magnificent and heats up well the next day. It suits vegetarians, makes an excellent side dish if cut in smaller pieces, and can even be served as a first course. It has both Gourmet Goddess and Goddess on the Go qualities because it has all the ingredients and flavor combinations that qualify as gourmet and uses no boil lasagna and prepared Alfredo sauce. Make your life easier with this delectable make ahead dish. I am sure that your guests will be thankful. Always Stay in Touch with Your Inner Goddess! Add butternut squash, salt and pepper. Toss to coat cubes. Bring butternut squash to a low boil and continue boiling on low 15 - 20 minutes until soft. Strain let cool a bit and puree. Add in ricotta, 2 tablespoons grated Amaretti, brown sugar, nutmeg and pumpkin pie spice. Melt butter, add garlic add sage leaves until garlic browns a little. Reserve a bit of Alfredo without garlic and sage for bottom of pan. Cool slightly and add butter mixture to Alfredo Sauce in a medium size bowl and stir to incorporate. Spray roasting pan will olive oil spray. Place about 2/3 cup Alfredo Sauce to bottom of the pan. Layer 3 pieces of lasagna, 1 cup butternut squash puree, ½ cup mozzarella, 2 tablespoons grated parmesan cheese and 1/2 cup Alfredo Sauce. Repeat 3 times and cover with Lasagna Noodles. Top with the rest of the Alfredo, ¾ cup mozzarella and 2 tablespoons parmesan. Before serving top ¼ cup grated Amaretti Cookies. Cook at 375 about 40 minutes till bubbling. Brown top under broiler for 1 – 2 minutes. Bring to room temperature for an hour and then bake 40 minutes or till bubbling. Brown top under broiler if necessary.